Understanding Acid rain is defined as any kind of rain with a pH below 5.6. Rain is naturally acidic (pH slightly under 6) for carbon dioxide (CO2) in the air with a water-soluble form of the acid rain has weakened. 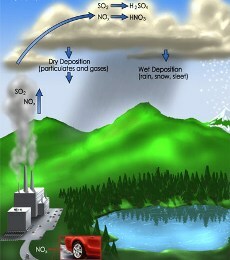 Type of acid rain is very beneficial as it helps dissolve minerals in the soil needed by plants and animals. Acid rain is caused by sulfur (sulfur), which is an impurity in fossil fuels and nitrogen in the air reacts with oxygen to form sulfur dioxide and nitrogen oxides. These substances diffuse into the atmosphere and react with water to form sulfuric acid and nitric acid soluble so it falls with rain water. Acid rain will increase the acidity of the soil and surface water that proved harmful to fish and plant life. Attempts to overcome this is currently being aggressively implemented. Naturally occur due to acid rain bursts from volcanoes and from biological processes in soil, marshes, and sea. However, the majority of acid rain is caused by human activities such as industry, power plants, motor vehicles and agricultural processing plants (especially ammonia). The gases produced by this process can be carried by the wind to hundreds of kilometers in the atmosphere before it turns into acid and deposited on the ground. Acid rain since the industry has become an important issue in the People's Republic of China, Western Europe, Russia and areas in the wind direction. Acid rain from power plants in the western USA has destroyed forests in New York and New England. Power plants generally use coal as fuel.